Everyone’s favorite part of going to the grocery store, concerts, or any large event is the free samples. Samples are a fantastic marketing tool for drinks, food, or other products that require experience to know the quality of the product. They can help customers decide to buy your product, without having to wonder if they’ll like it. Product samples help customers make the leap from interested to brand loyal. Everyone knows the feeling standing in a store staring at a product, wondering if you should buy it because you’re not sure if you’re going to like it. Samples take that guessing game away. When people can actually try your ice cream, they know they’ll love it so they’re more likely to buy it. Thi is especially with food and drink products. People already have trusted brands and flavors they know they love. If they only buy ice cream once a month, they don’t want to risk the unknown. Sampling allows customers to experience your product without committing, just like dipping a toe in the pool before you jump in or going on a date before you decide to get married. People don’t want to buy products they aren’t 100% sure about. They don’t want to get home and be disappointed when they open up the can. Sampling your wholesale ice cream can take all these worries away and give them the final push they need to try your product. If you’ve decided to sample your product, you now have a big choice to make. Which product are you going to sample? Of course you can sample all your products, but that gets very costly very fast. Generally, there are three kinds of sampling strategies: new products, hidden gems, or bestselling items. Depending on your company, you might pick one or alternate between the three. 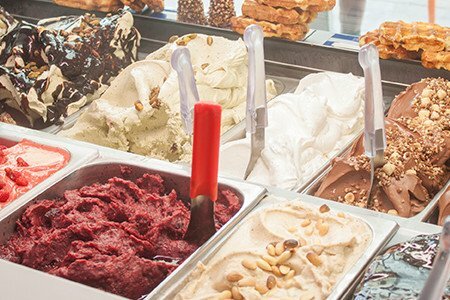 While newer brands might focus on sampling their best selling vanilla flavor to optimize brand conversion, established companies might focus on sampling hidden gems or new products to get them discovered. Bloggers and video bloggers have developed cult followings of who watch or read their reviews to find new products to buy. If you send your wholesale ice cream to a food blogger to review, not only will you get feedback but your product will be shared with thousands of viewers who now want to try your ice cream. Sponsoring an event, like a concert or marathon, is an easy way to get brand recognition. Not only will your wholesale ice cream be extensively marketed at the event, but it will give people an opportunity to try your product. After seeing the name of your brand plastered everywhere over the course of several days, they’ll be interested and more likely to buy your product. This can be expensive, so make sure the event reflects your brand in some way. For example, a low fat ice cream would sample much better at a marathon than a calorie-laden one. College students will try anything if it’s free. They are also the best social media campaign you can find. When they receive a cool sample, they’ll snap a pic and throw it on their story. In the era of Instagram and Snapchat, everything is shared and everyone wants to be up-to-date with the latest trends. After seeing a dozen or so of their friends with the same product, even people who didn’t sample your product will want to buy it.